這麼參數蠻常使用的.在 iPerf2 server 端可以同時接受多個 Clients 端的請求,但 iPerf3 使用這個參數就不行接受多個 Clients 端的請求(只能 1 對1). 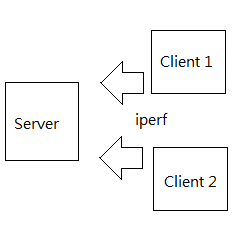 -s, –server : iPerf2 can handle multiple client requests. iPerf3 will only allow one iperf connection at a time. Run the server in background as a daemo (不確定這個 參數是不是可以用在多對一). Try `iperf --help' for more information.